Hi everyone it’s Cindy here to tell you about another crafty thing I’ve been up to in the past couple months. A while ago Miss N, a younger member of the knitting and crocheting group I belong to, put out a call to action on Facebook looking for someone that could help her convert some jeans she had to skirts. Miss N is working towards her Doctor of Ministry degree. For her internship this year she is working at a university interfaith chapel where she interacts with people of many faiths. In keeping with the preferences of certain religions Miss N wanted to be able to have some long skirts to wear for work. Other than formal wear there wasn’t much she could find in the stores to fulfill her requirements so she was hoping she could convert a couple pair of jeans to skirts. If you are of a certain age like I am you might remember making these as a youngster. Back in the seventies it was cool to turn your jeans into skirts. We usually did them short and were able to use the bottom of the legs for the filler piece. Since Miss N wanted the skirts to be long I had to find fabric to fill in the center area. Miss N came to my home and we looked through my fabric stash to see what would work well. With a little help from Charlie we decided on the two batik fabrics you see above. 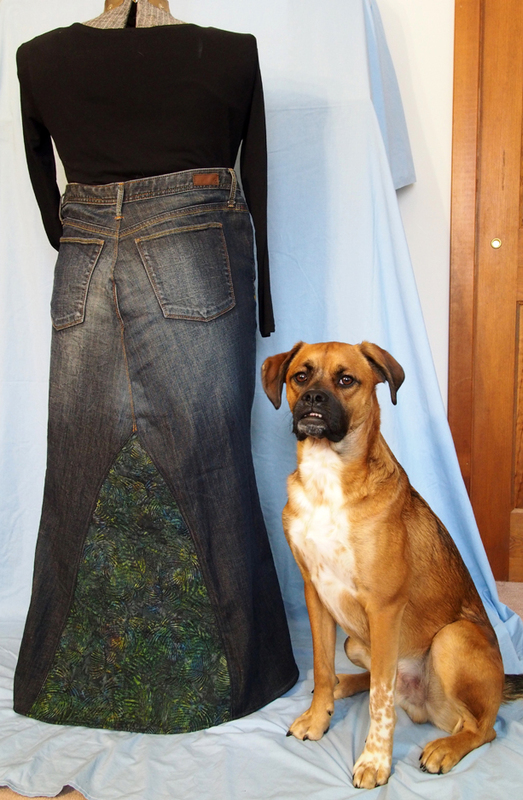 Now I’ll show you how I transformed a couple pair of jeans to the skirts. 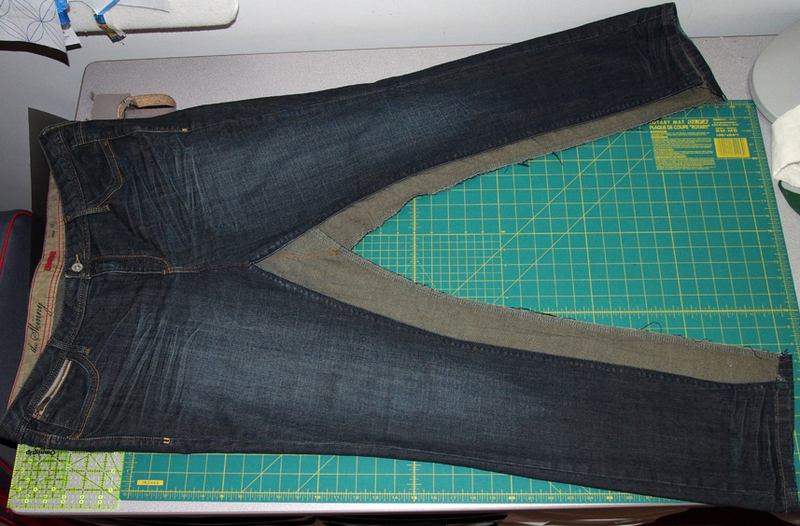 The first thing you have to do is rip open the inseams and the center crotch seam of the pants. 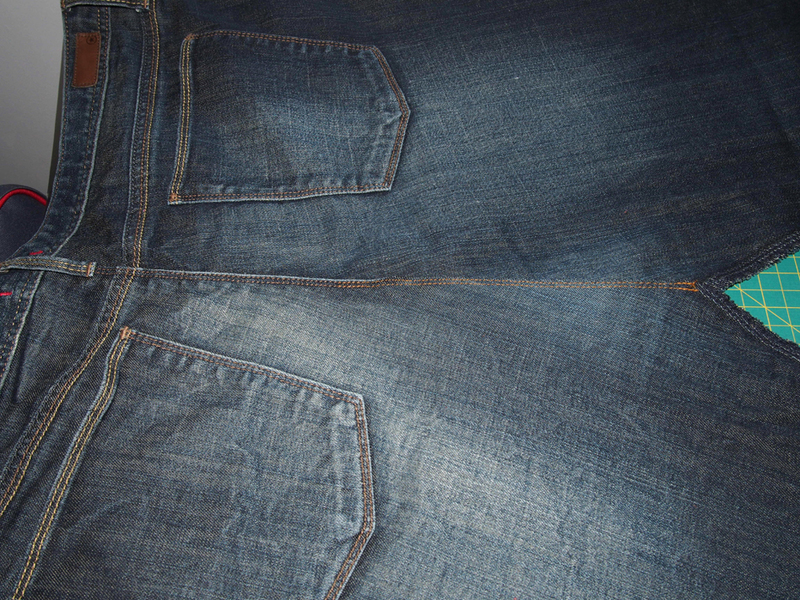 Then you adjust the front and back center seams so they lay flat and re-sew them. In order to fill the open area I had to make a pattern for the front and the back. I have a large roll of drawing paper that I placed under the legs and then drew a line to mark the edge. If you look close you can see that the paper was folded in half. After I drew the initial line I folded the paper in half and then adjusted the pattern to be the same shape on both halves. I also had to add about a half inch for a seam allowance. 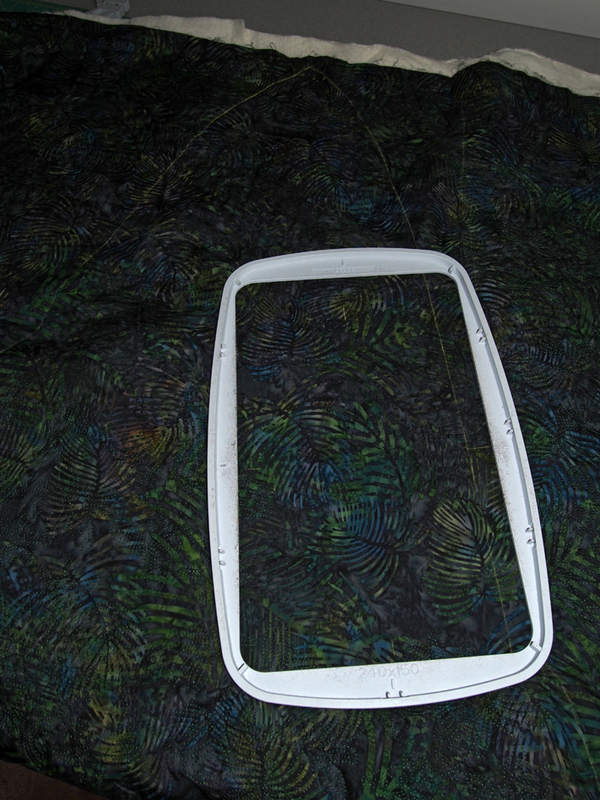 I then traced the shapes to the fabric. 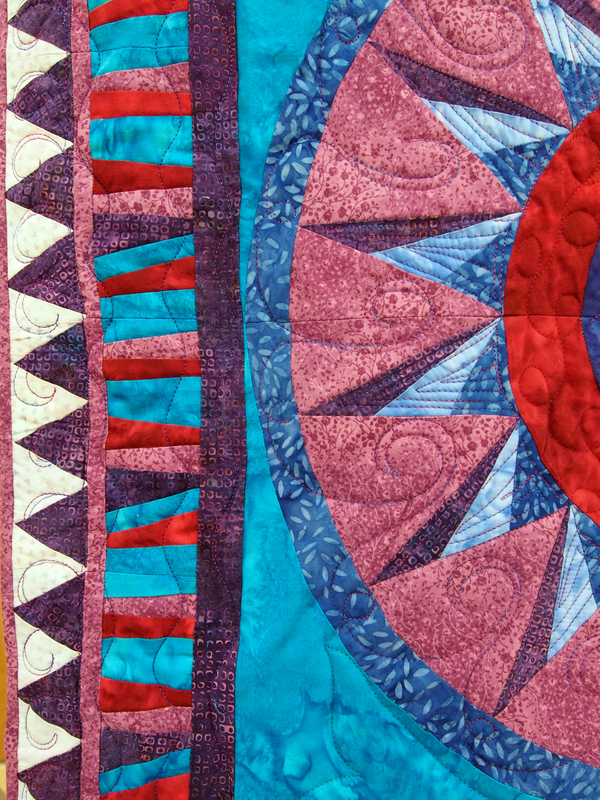 Since batik fabric is fairly light weight I decided to add a little heft to the center areas. I used a thin muslin for backing and a very light weight batting and then did some quilting to hold all of it together. The truth is I let my embroidery machine do the quilting. If you look closely in the picture above you can see the line I drew on the fabric from the patterns I made. 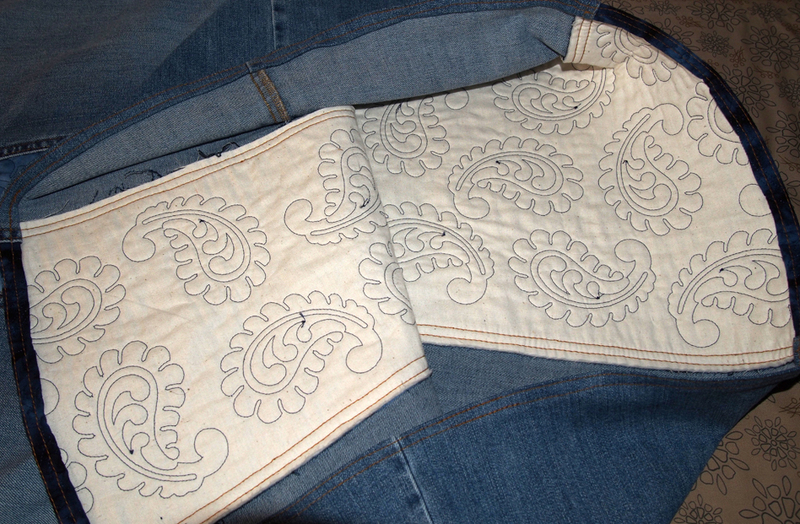 On the light colored skirt I used a paisley style of quilting. You can see the pattern on the reverse side better. For each paisley I had to re-position the embroidery hoop. There were about 10 on each side. 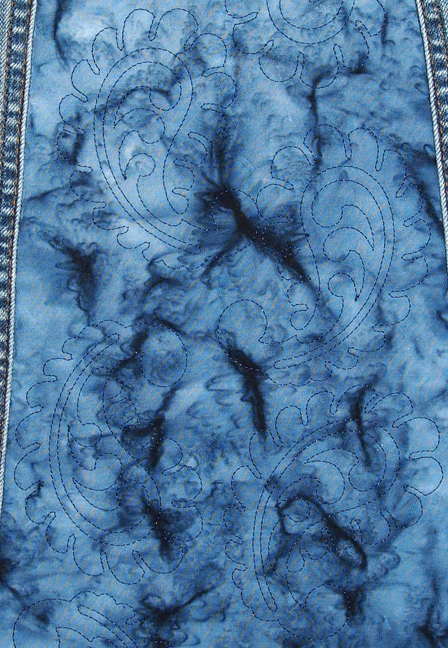 I used a dark blue thread that blended well with the fabric. 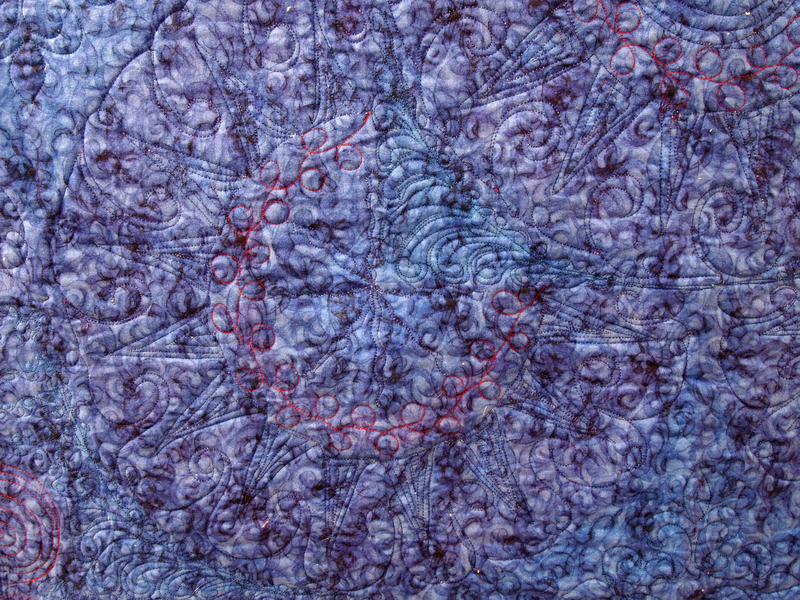 For the jungle batik I used a quilt design that had butterflies and flowers and quilted it in a dark green thread. 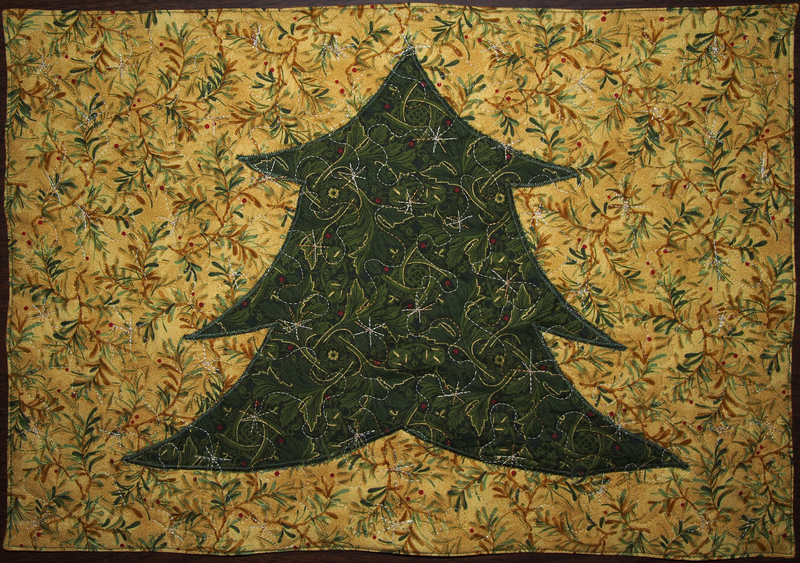 I fit each block of quilting together so most of the fabric was quilted. After the quilting was done I cut the front and backs out. 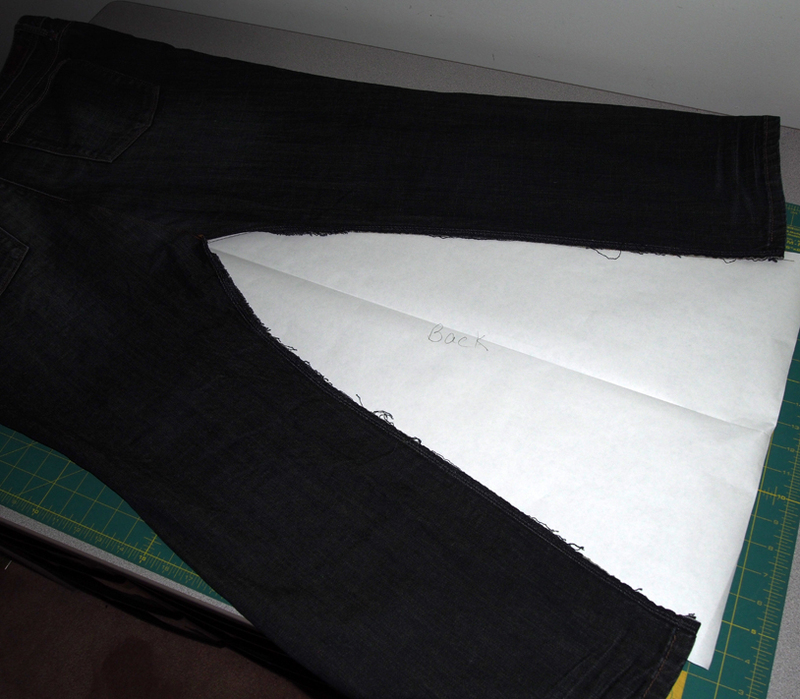 Then it was just a matter of pinning them in place and sewing them to the jeans. The final step was to fit and sew the hem. I’m happy to say that Miss N was very excited to get her new skirts. While I don’t have a picture of Miss N in her skirts my super model Walter was more than happy to pose with them for me. I was glad I could help out a friend with this project and didn’t ask for anything in return but Miss N insisted on compensating me and gave me a gift card for one of the eateries where our knitting/crochet group meets. Thanks Miss N I was happy to help you out on this fun project. Hi everyone! Yes, we are alive and well. So sorry for the unexplained absence the past week or so, but I’m here to tell you all about it. 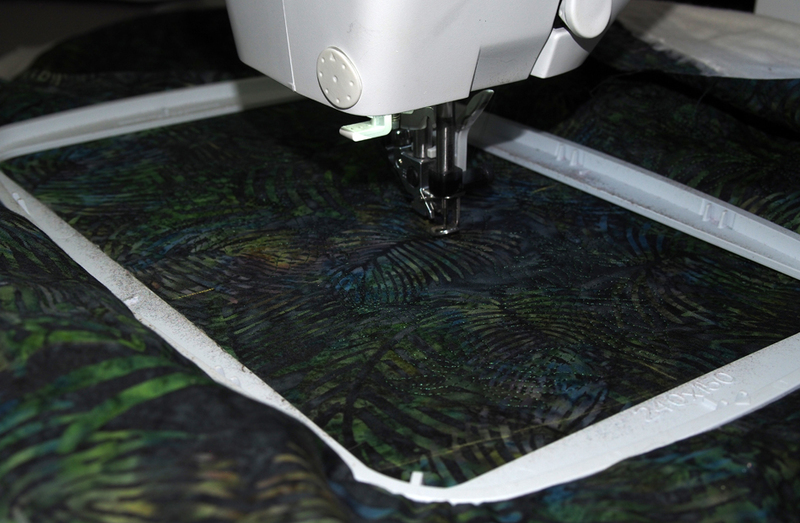 Last week was a very busy quilty week for me. 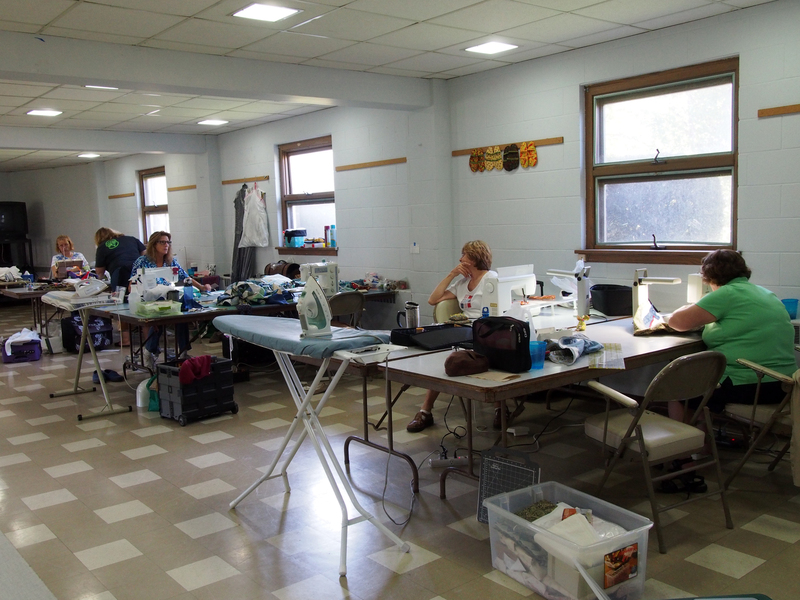 Monday and Wednesday were the first meetings for both of the quilt clubs I belong to. I’m now the membership secretary for the Genesee Valley Quilt Club so that means extra work to get ready for the meetings each month. Then on Thursday my mom and I went on a quilting retreat and didn’t get home until late Saturday. We had lots of fun and that is what I’m going to tell you about today. 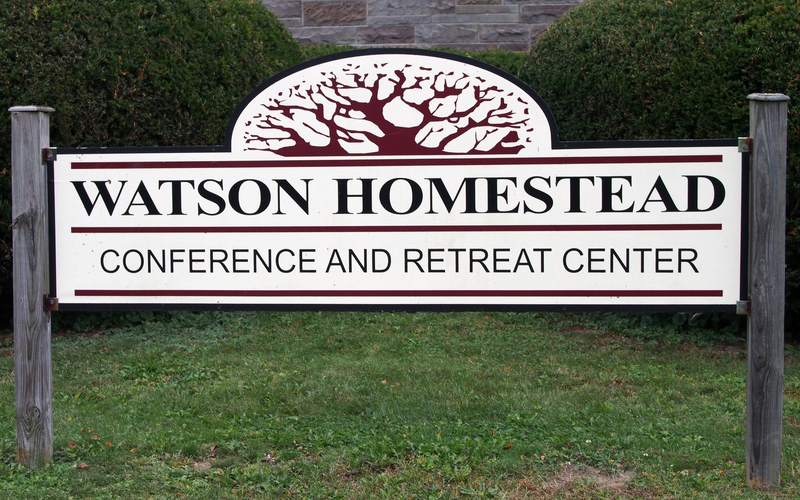 Our retreat was organized by the Perinton Quilt Guild and was held at Watson Homestead. My mom picked me up Thursday morning and we made the 1 1/2 hour trip south in perfect weather. 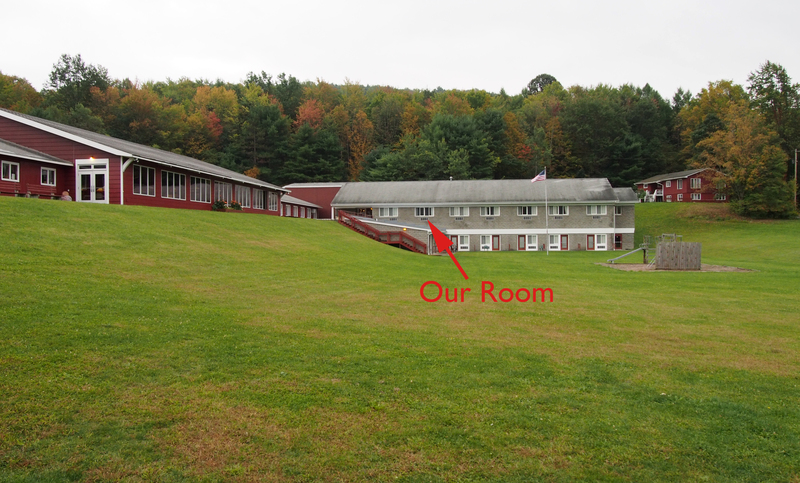 We unpacked all our quilting stuff and then headed to our room. 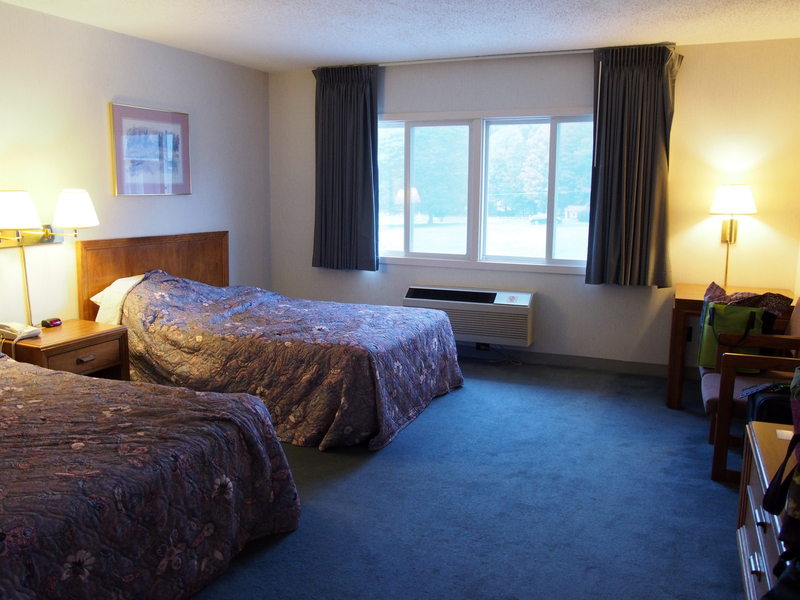 A nice hotel style room, but with no TV. WiFi was available in the common areas so I was able to keep up with reading blogs, but didn’t take much time to comment. 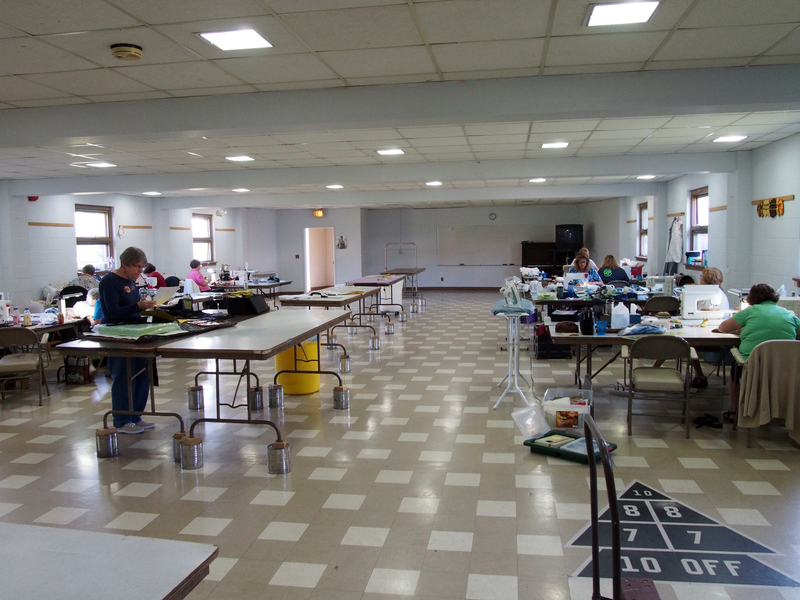 Our workroom was large and bright. With only twelve of us there was room for each of us to have our own table as well as some common tables in the middle for us to do our cutting or lay out our projects. Right away my mom and I, who had never been on one of these retreats before, noticed an unusual picture posted at both ends of the room. The ladies said that “Lance” comes with them on every retreat. I believe he is from an Abercrombie and Fitch bag. We knew right then that this weekend was going to be fun. Most of the ladies brought more than one project. 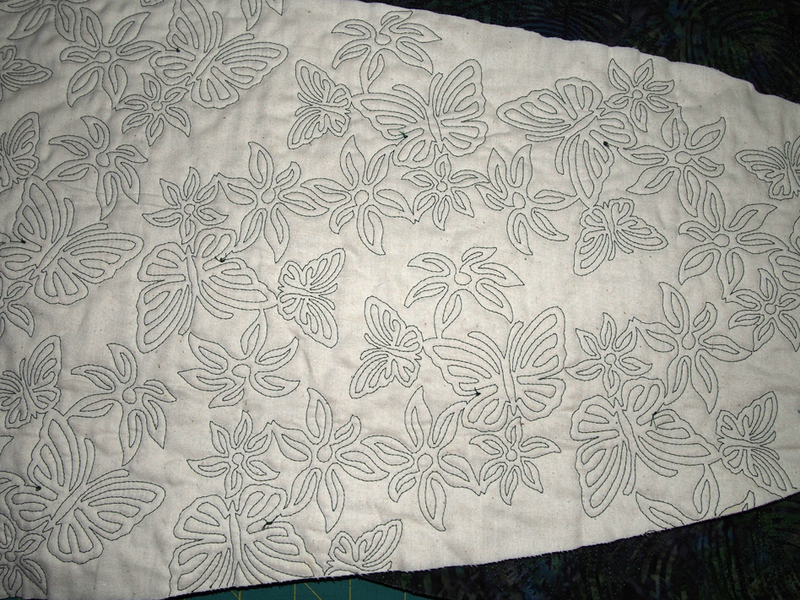 I started out by working on the quilting for the king sized quilt I had basted way too long ago. I can’t remember when the last time was that I did some quilting on this project, but I hit a wall when I was having problems with the fabric bunching up. The first thing I had to do was pick out some of the last bit I had stitched and start over. I’m happy to say that I was able to complete quilting the parts I wanted to and now feel better about keeping it going. Everyone had a great time working on their projects and getting to know each other a little better. One of my favorite projects was one that Patty P. worked on. Patty P says her brothers aren’t really devils. In addition to lots of quilting and chatting we also had some great catered meals. 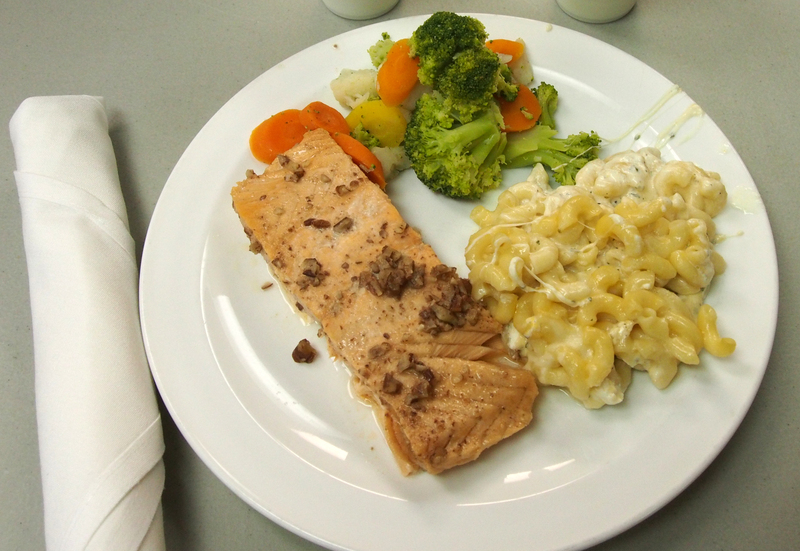 We were very lucky on Friday night and were treated to a delicious salmon dinner with a side of macaroni and cheese that was incredibly creamy. 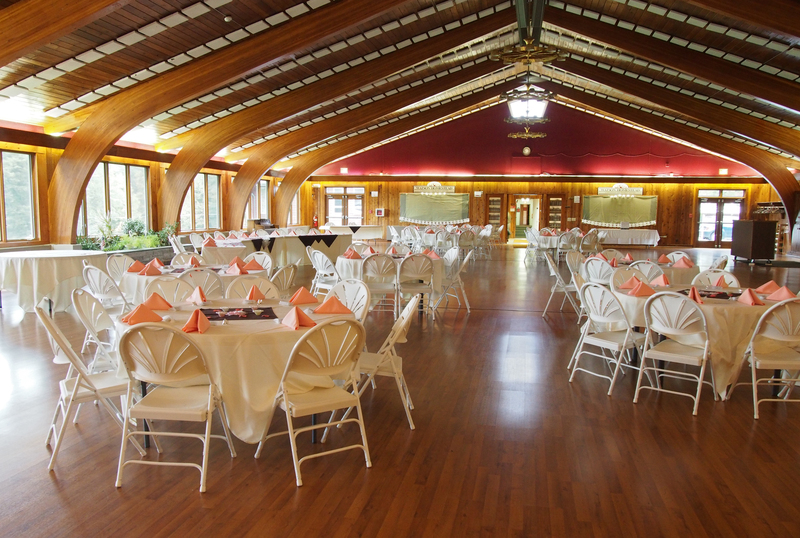 Apparently salmon is not a common meal to have, but the caterer had an earlier event where he served the salmon and there were far fewer attendees than he was told. We were the lucky recipients of this great left over meal. To top that meal off we also had a scrumptious dessert. 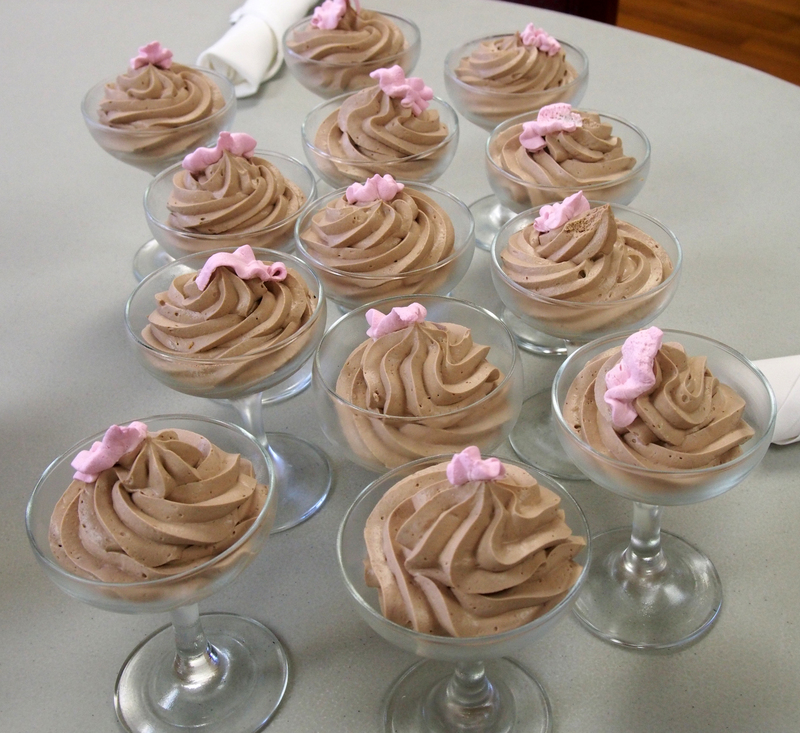 All our meals were great if not quite as special as the salmon with mousse. 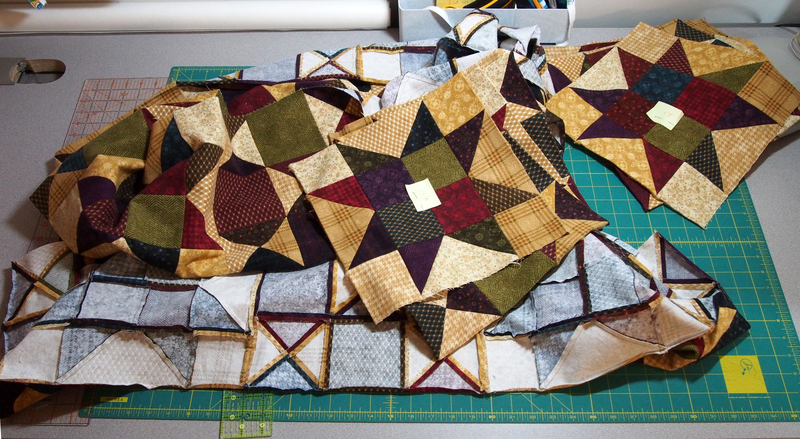 On our last day there I worked on piecing the backing for the flannel quilt top I finished a while ago. In addition to our work room there was another smaller room that had large blank walls. I came prepared with the batting, quilt top, painters tape and 505 spray baste in the hopes I would have a place to baste all the parts together. I didn’t take pictures of the process, but first I taped the backing with wrong side facing out to the wall. Then I sprayed the backing with the adhesive. The next step is to stick the batting to the backing. Of course it isn’t that simple, but for the sake of finishing this post lets just say it went on smoothly. The last step is to spray the batting and then stick the quilt top to it. I was jumping for joy to get this done. At home I don’t have a wall tall enough to do this so the only alternative is to pin the backing to the floor and do the same process on my hands and knees. This is so much easier! As you saw above there was a wedding held at the center Saturday evening. Claire and I decided to surprise the happy couple with a little gift and made a couple of Christmas placemats for them. 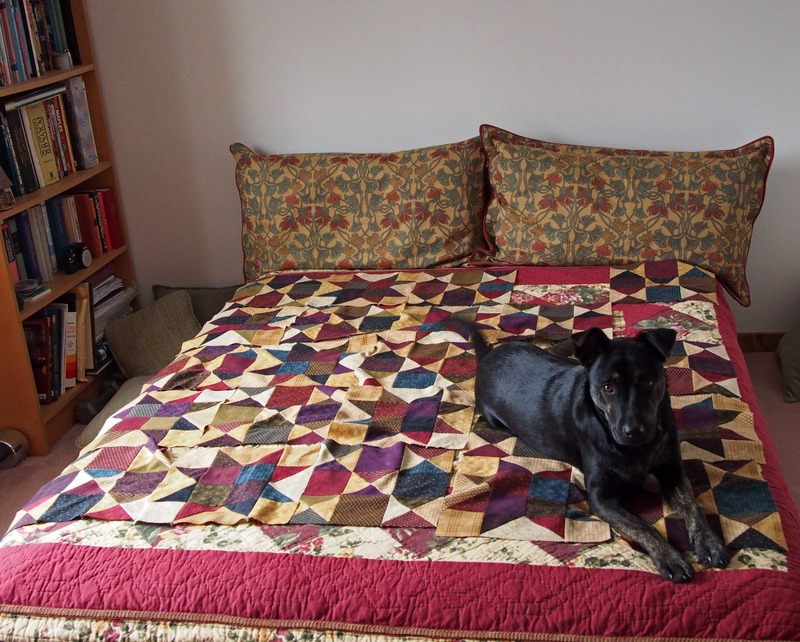 My mom did the sewing and I did the quilting. We never found the bride or groom, but were able to give the gift to the brides father and hope the youngsters like them. 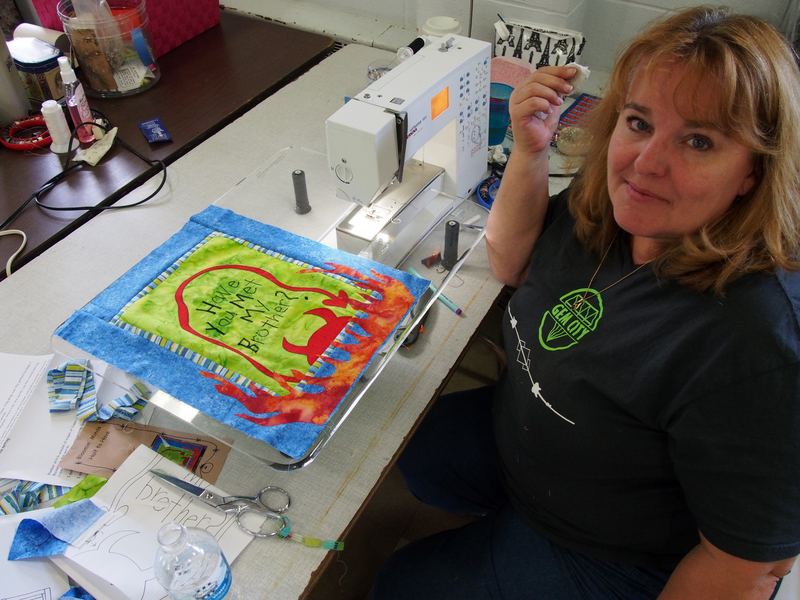 For our first ever quilt retreat we had a great time and I have plans on going next year too. I think Claire will join me if it fits her schedule too. Thanks to Sue P-T for organizing the retreat and thanks to all the other ladies for helping my mom and I to have such a fun time. Get your Blue Moon Magic Raffle tickets now! As blog followers may recall my mom and I coordinated the making of this years Genesee Valley Quilt Club raffle quilt. I have set up a fundraising page through youCaring.org where you can purchase tickets. 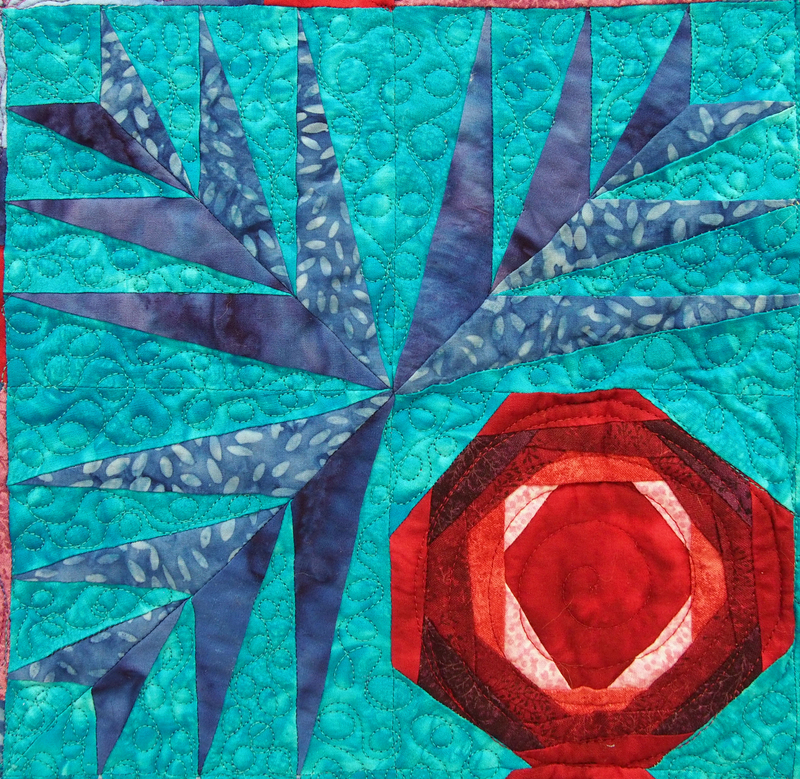 Made by the Genesee Valley Quilt Club, this pieced and quilted work is 90″ x 90″ and will be raffled off to benefit the club and the Community Quilting Bee of Sojourner House at Pathstone. Raffle tickets are $1 each. Tickets may be purchased world wide, but international winners will be required to pay shipping. Shipping is free to any winner living in the United States. For each $1 donation a raffle ticket will be filled out with your contact information and you will receive your raffle ticket stub in the mail as confirmation. You may check the boxes to hide your donation amount or to make your donation anonymous so your information doesn’t show up on the fundraiser site. Your contact information is available to the fundraiser administrator only. Update: I realize that not all of my followers use Paypal or like to use a credit card on the internet so if you would like to purchase tickets with a check just leave me a message in the comments section (make sure a valid email is used with your comment) and I will send you an email with information on where to mail your payment. 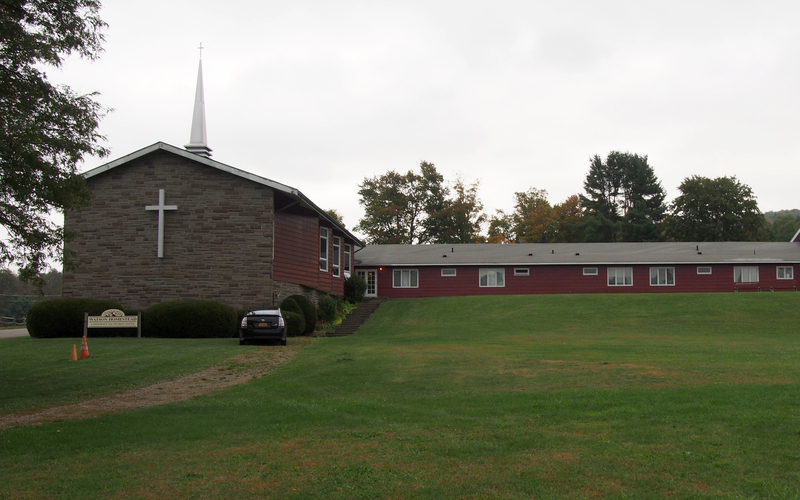 The drawing will take place on June 2, 2013 at 2:00 pm (Eastern time) at the RIT Gordon Field House in Rochester, NY. You do not need to be present to win. 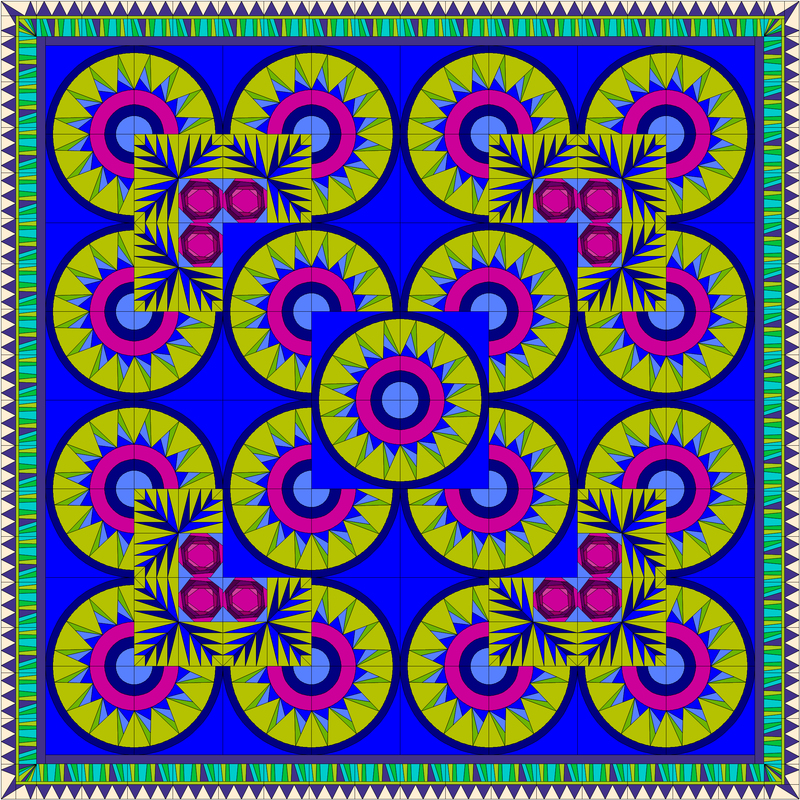 Feel free to grab the badge above or any images of this quilt from my site to pass the word on this raffle. You can also go to the donation page and use the “Spread the Word!” section to help promote the raffle. If you have a non-wordpress blog you can create a widget like the one pictured below to put on your site as well. Thank you very much for your support! 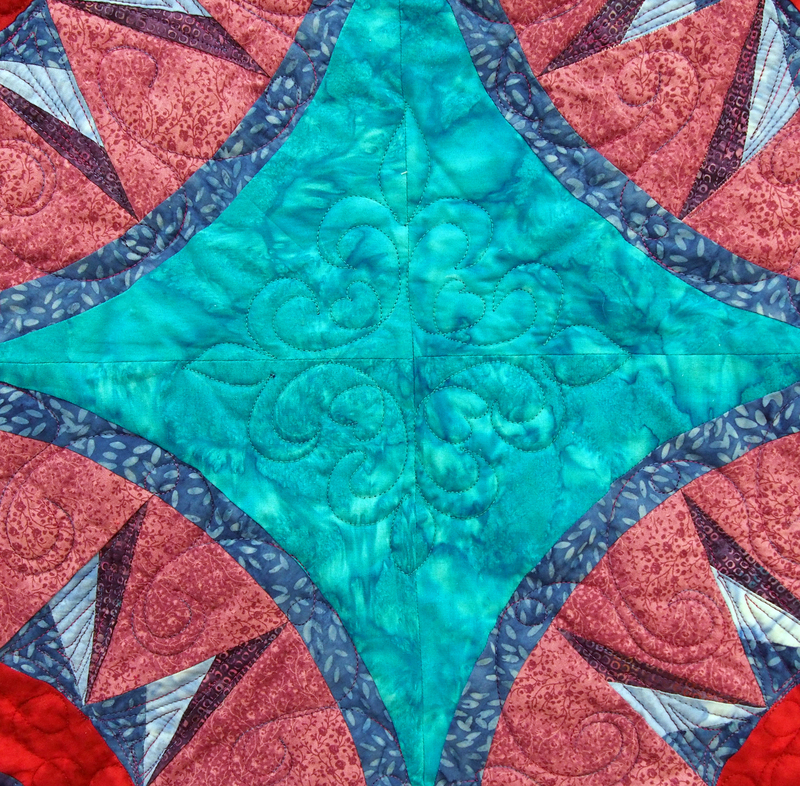 I hope one of my readers wins this beautiful quilt (if I don’t)! 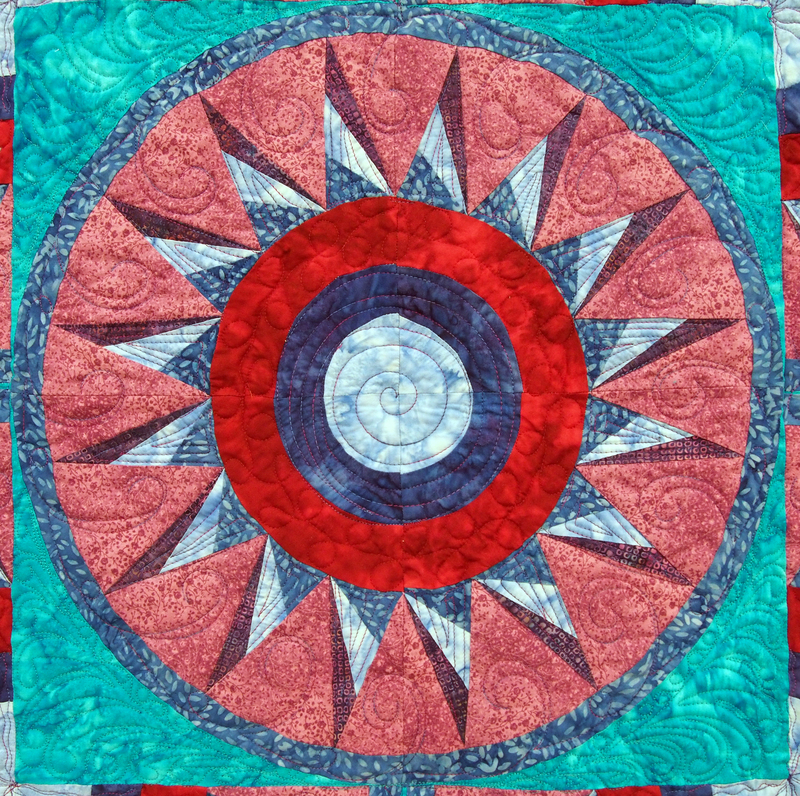 If you are in the Rochester, New York area from May 31 – June 2, 2013 please plan on visiting the GVQC quilt show “Magical Threads — Inspired Stitches” where the Blue Moon Magic quilt will be on display along with hundreds of other quilts. First up I would like to report that Lily Belle is home and feeling better. She is not completely out of the woods yet though. 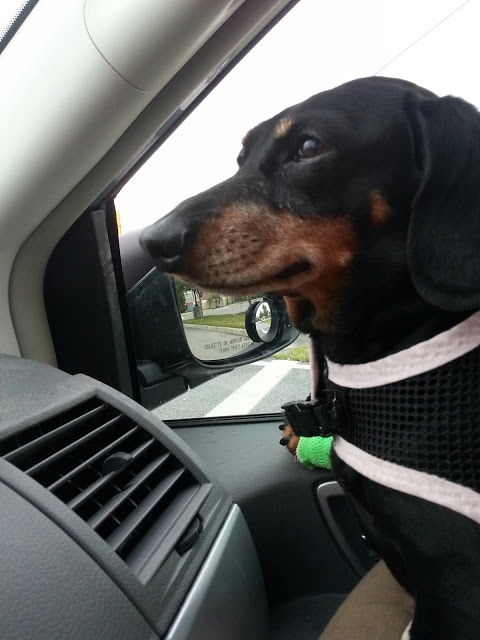 Thanks to all my friends for your Power of the Paw to help her get better. I know Lily Belle thanks you too. As ye Sew so Shall ye Rip! Hi everyone! Remember a while ago when I accused Millie of causing mischief while I was laying out the quilt blocks for the flannel quilt I am working on? Well I think I owe her an apology. After I finished putting the blocks together I kept them hanging on my design wall while I worked on the flying geese border. I kept looking at the blocks and while it looked very nice I felt that something wasn’t quite right. I remember noticing while looking at the picture on the instructions that there was a secondary pattern that should be visible, but I couldn’t see it. 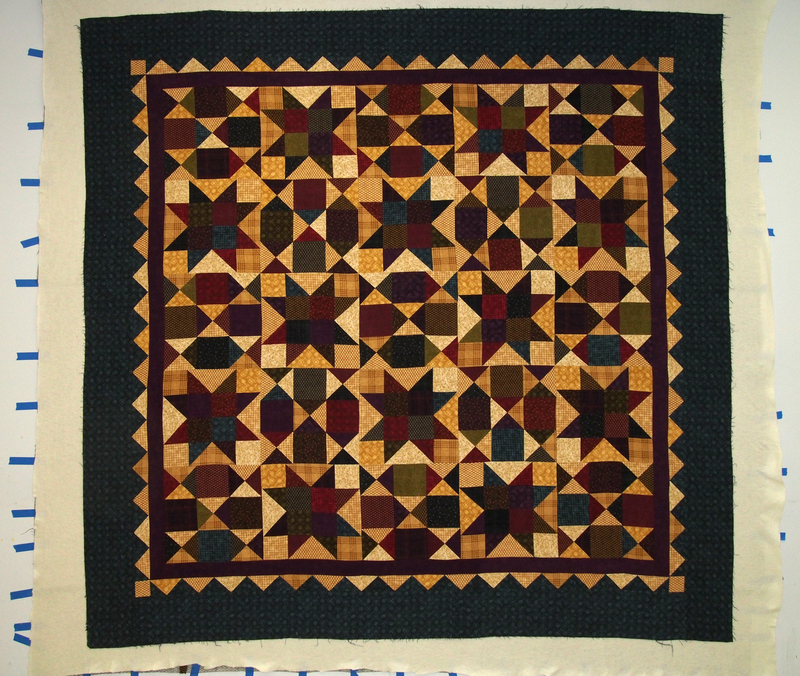 In case you aren’t a quilter a secondary pattern is when two or more blocks together draw your eye to more than the actual block (I tried to Google it but I couldn’t find anything). I got out the instructions again and discovered my problem. What I realized was that in the second and fourth rows the hour-glass blocks should have been rotated 90°s. The bottom line was that I needed to rip all the rows apart and completely separate the blocks in two of the rows. I think Millie was trying to tell me to check my instructions before sewing everything together, but I didn’t listen. It may be difficult to see, but if you compare the two pictures you should see that the stars in the middle row now have more cream-colored fabric surrounding them. It is also there for the first and last row, but not as complete. I could have just left the blocks the way they were, but I think the proper arrangement will make it a bit easier to quilt. After adding the three borders the top is now ready to baste and quilt. 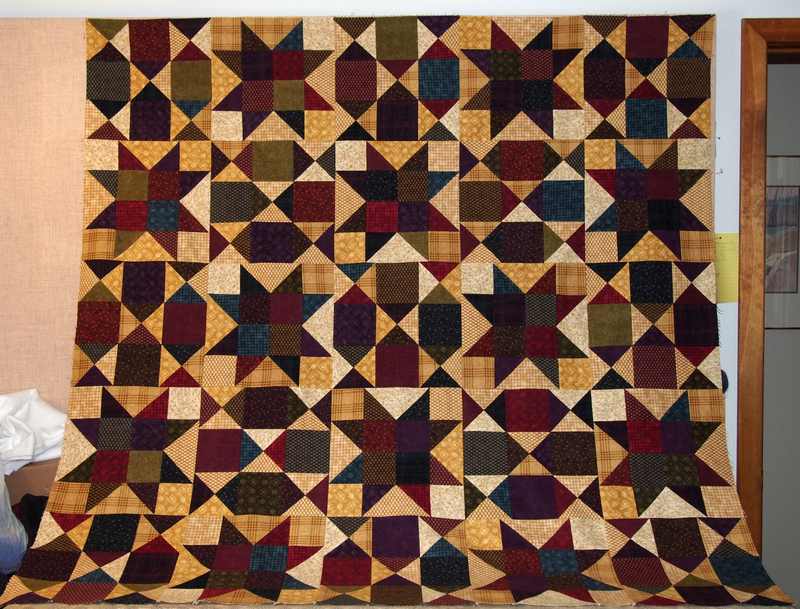 It’s finished size is 80″ x 80″ so it is a generous lap quilt. My goal is to get this quilt completed soon so I can also finish quilting my king sized quilt and have them both ready for the Genesee Valley Quilt Club show in June. I purchased two different threads to use on this quilt. 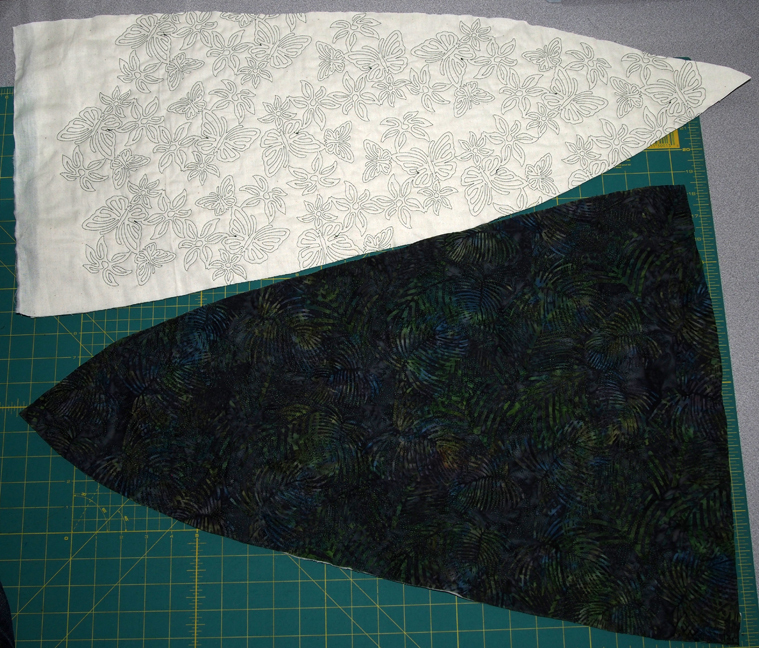 One is cream variegated and the other is a variegated thread with similar colors to the dark fabrics in the quilt. Of course using two different thread colors will make it take a bit longer, but I didn’t think that I could pick one thread color to use across the entire quilt. There is also enough left over fabric (especially all the left over triangles from making so many half-square triangles) that I should be able to make some pillows to go with it too. 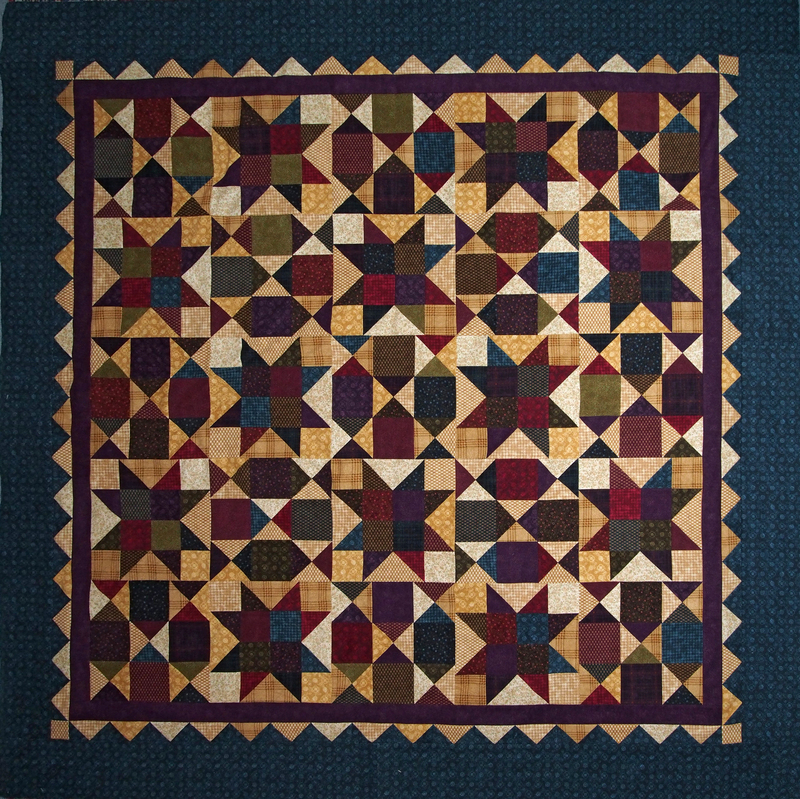 I just love the rich colors in this quilt and since it is flannel it is extra soft too. I hope you like it too. Hi everyone, it’s Millie here. Do you remember a while back when my mom showed pieces of fabric and asked if you could tell what it would be? She has been working very hard on this project lately and I have been helping her along the way. She took all those parts and made them into two different blocks. Then she had to lay them all out so she could sew them together to make the main part of the quilt. This is where she needed my help the most. I had to make sure she was placing the Hour Glass blocks in the proper orientation. They all have to be in the same direction. I was also helping her by making sure none of the same fabrics were touching especially the light-colored ones. Once she had the layout all set I knew she would need help to keep the blocks from flying off the bed. So I laid on them to hold them down. 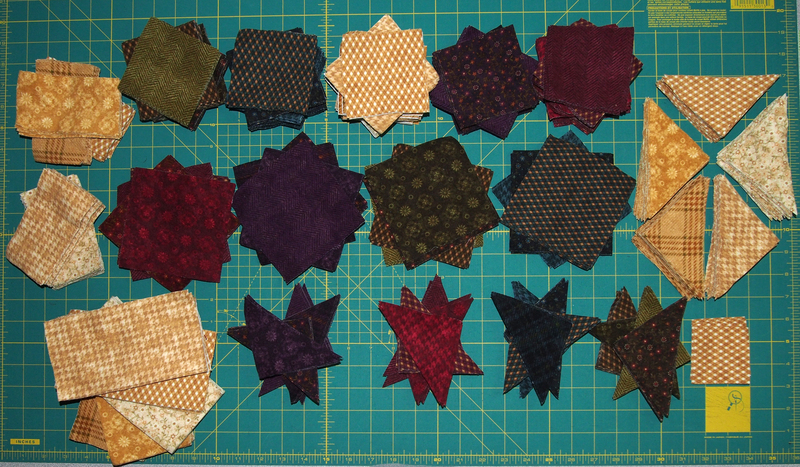 Here are the blocks all sewn together. I think mom did a good job, but you know it wouldn’t have turned out this well without my help. Next up she has to add the borders. There are three different pieces to the border with one of them being made of flying geese which according to my mom is a lot of work. Well we better get back to work or this quilt won’t make itself. A year and a half ago the president of the GVQC approached my mother and I and asked if we would be interested in creating the raffle quilt for the 2013 GVQC Quilt Show. We told her we would discuss it and get back to her. Well you know how it goes, someone asks you politely to do something and it can be hard to refuse. We thought that since we would be working on it together it wouldn’t be too bad right? So of course we agreed to do it. Designing quilts from scratch was not a strong point for either my mom or I. 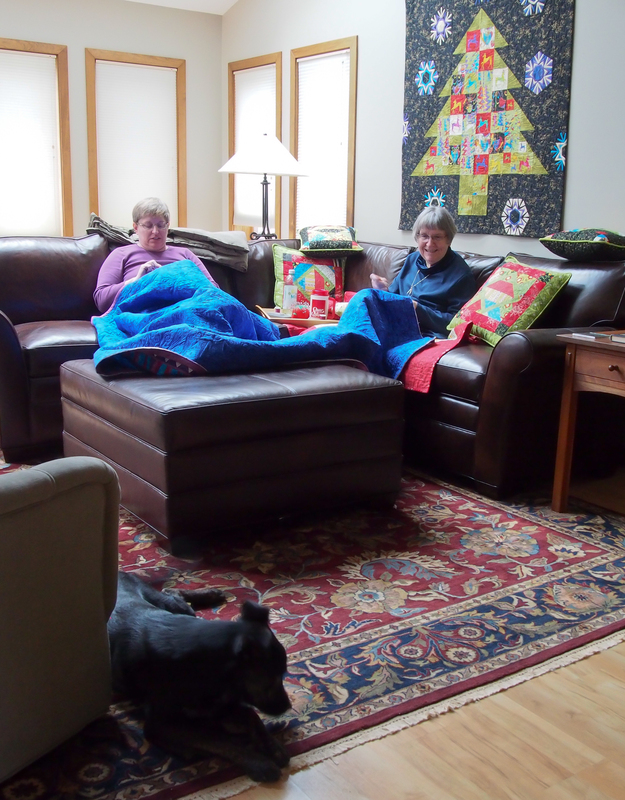 We got together a few times and discussed the types of quilts we like to look at and searched through quilt magazines and past quilt calendars for inspiration. 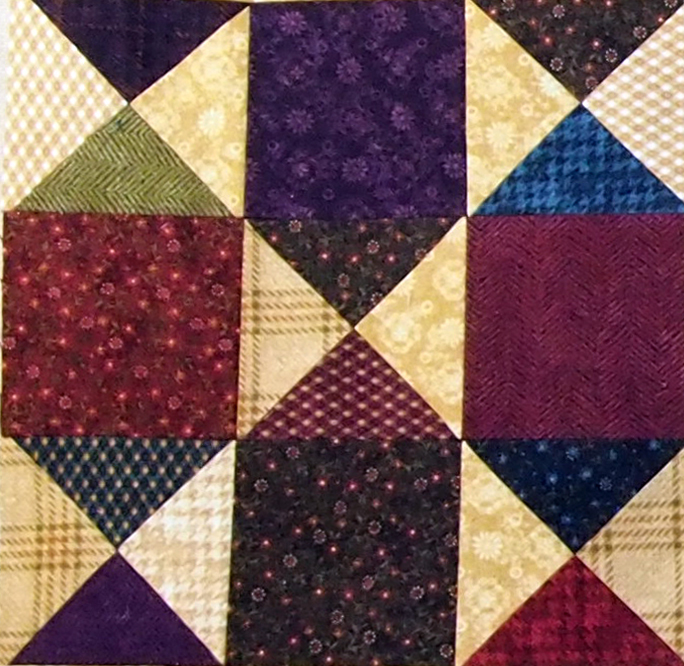 My mom said that she liked New York Beauty blocks and would like the quilt to have some of those in it. 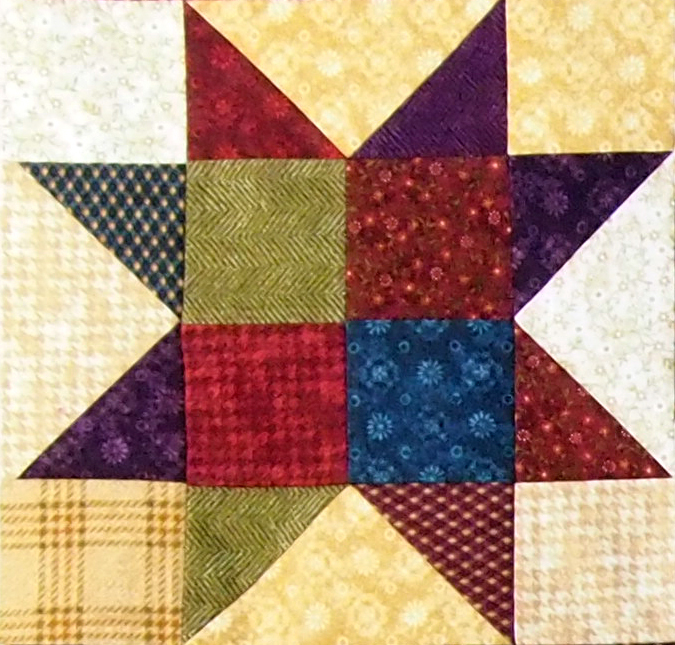 We found a couple of pictures of quilts that we liked the layout of to use as a starting point. 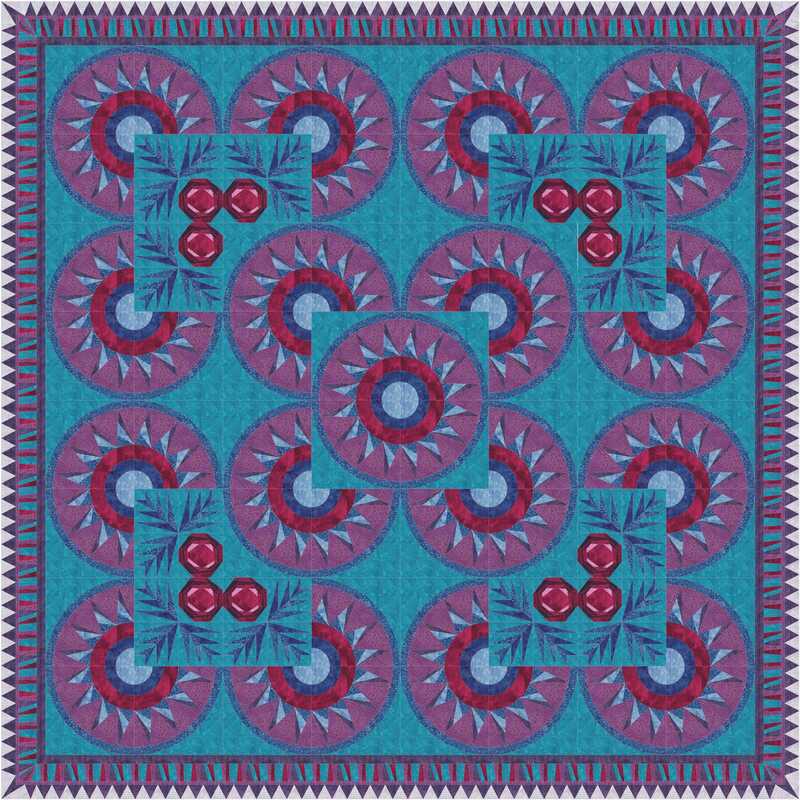 I was fortunate to be able to purchase Electric Quilt 7 (EQ7), a quilt design software, to help with creating the design. 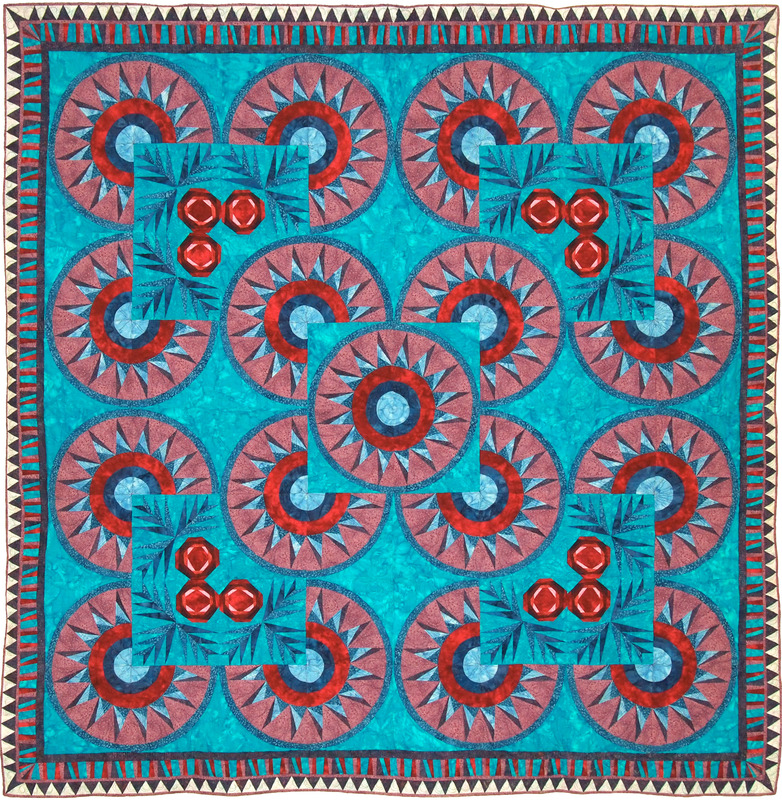 It was challenging to look through all the quilt blocks available in the EQ7 software to pick out the one I wanted for our quilt but I finally settled on one called “Sunrise Beauty”. I didn’t want the quilt to be just beauty blocks so I added some palm and crazy pineapple blocks. The final blocks to add were the border. I wanted something that would have a similar feel as the beauty blocks without distracting from them. I added a one inch border first and then chose the “Staccato Border” and “Staccato Corner” blocks. The next step was to choose the colors I wanted to use. My mom and I used some fabric catalogues to choose a pallet that we liked so I started from there. The colors that show up in the EQ7 software for each of the blocks is very different to how I colored them. I started with the beauty blocks, then the crazy pineapple (remember I wanted them to look like roses) and then the palm blocks. The final blocks I did were the borders. 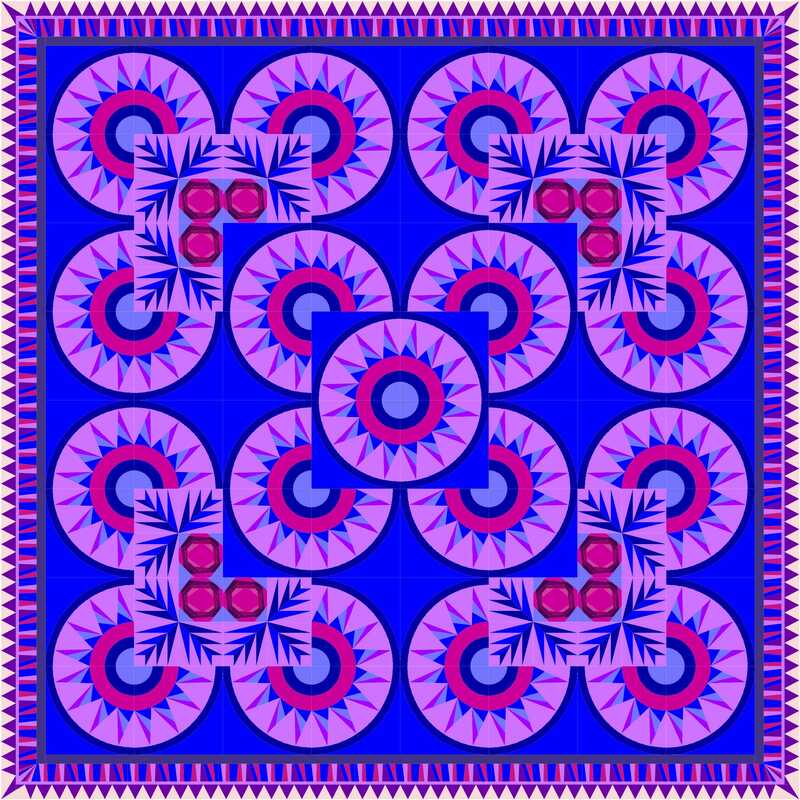 I just made sure that I repeated the colors from the rest of the quilt in the border and only added the white in the border. With the colors in place we took a trip to one of our local quilt shops to pick out samples of fabrics we wanted to use. We needed a dozen different fabrics for this quilt and only purchased a fat quarter of each fabric. We still needed approval from the board of directors on our design. 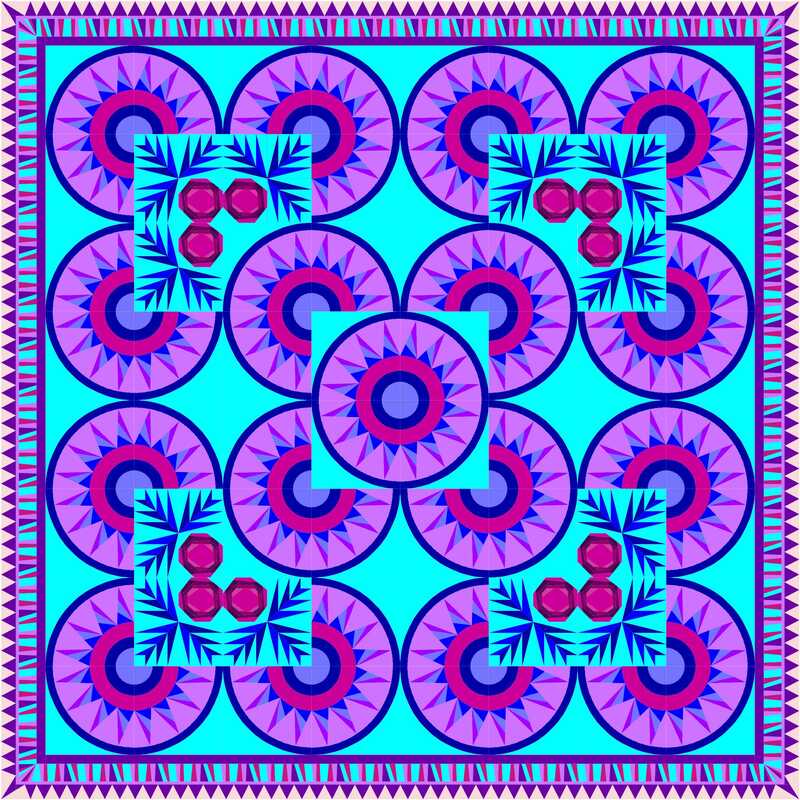 My mom took the fabrics and created a few samples of the blocks we wanted to use and I scanned the fabric into my computer and added those fabrics to the EQ7 design. With printouts and sample blocks in hand the board didn’t hesitate to approve our design. After all nobody else was going to jump in with a new design any time soon. The EQ7 software gave us estimates of the amount of fabric we would need so we hurried back to the fabric shop and picked up the yardage we needed of each one. 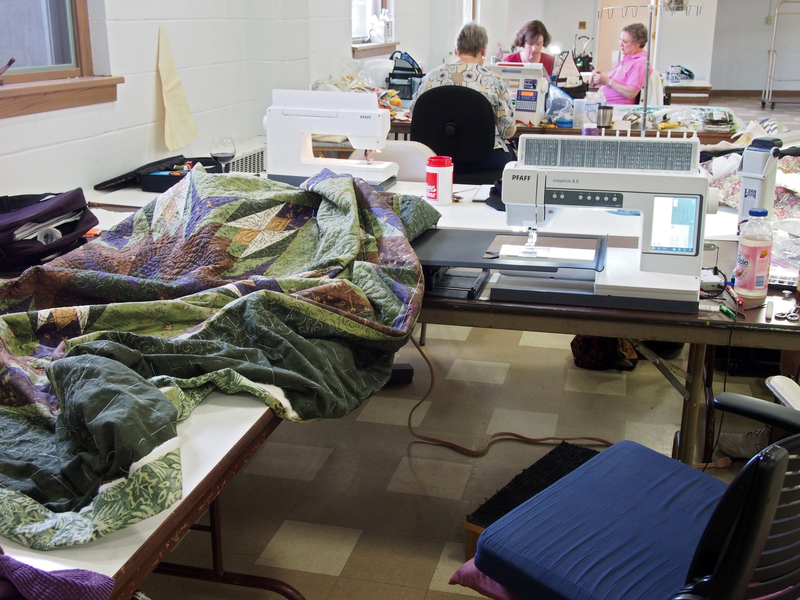 When we took on this task we had no expectation of sewing the quilt together by ourselves. 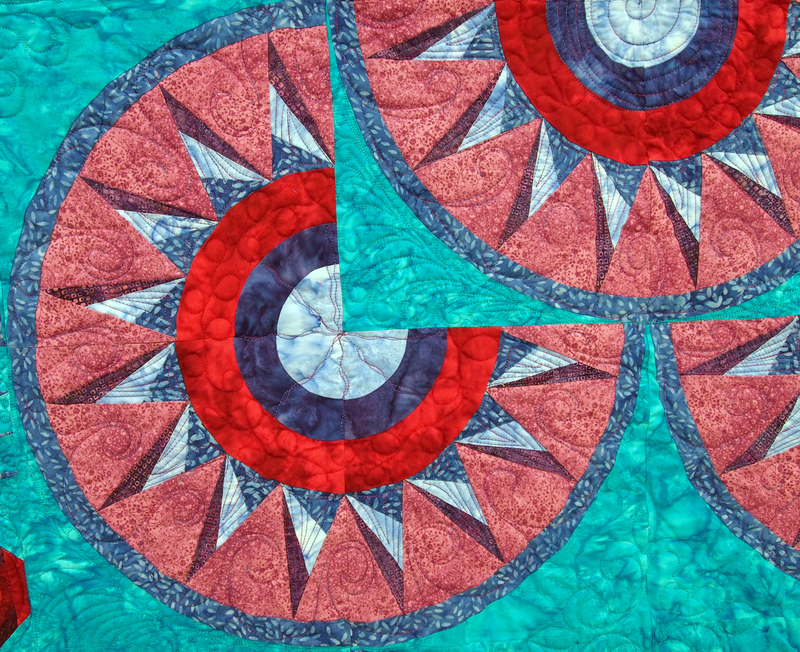 We chose paper pieced blocks for the quilt since they would allow for the most accuracy when sewn by many different people. The next project was to create kits to hand out for our club members to assemble. This required writing instructions, creating guides so the right fabric went in the right place, printing the paper templates, cutting the fabric and bundling it all into kits. We had a fun cutting party at my house (I was so busy keeping everyone working that I didn’t get any pictures) to put the kits together and then handed them out at the next GVQC meeting in May 2012. We asked everyone to bring them back no later than the September 2012 meeting (the club doesn’t meet in July and August). After all the blocks were returned we sorted through them, fixed a few problems and created a few blocks that we were short on. It was time for another party to assemble the quilt. 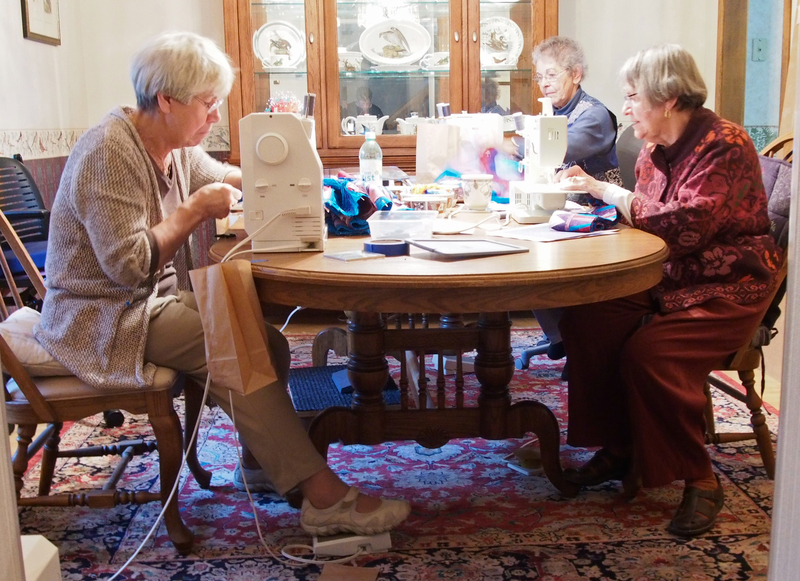 A couple of the ladies from the club joined my mom (Claire) and I to sew the blocks together. I pinned the rows up on a huge piece of cardboard and each one took a row. I pieced all the border blocks together. There were a ton of seams to press! We did the sewing in my dining room and pressing in the kitchen. I have a huge table that easily fit all of us and our machines. After a few hours the top was completed! Now to find someone to quilt it. 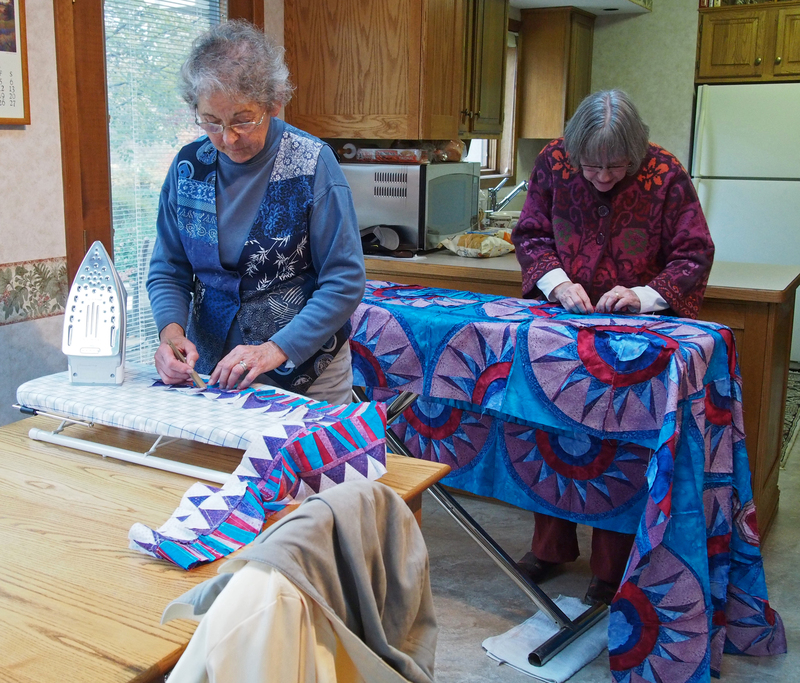 Every time Claire and I stood up in front of the club asking for help we emphasized that we would like to find a member with a longarm quilting machine to do the quilting, but no one stepped up. Finally when we were collecting the blocks in September Karen Kiener of The Cottage Quilter finally offered to do the quilting. If you click on the pictures above you can see what a fantastic job she did to enhance our quilt. 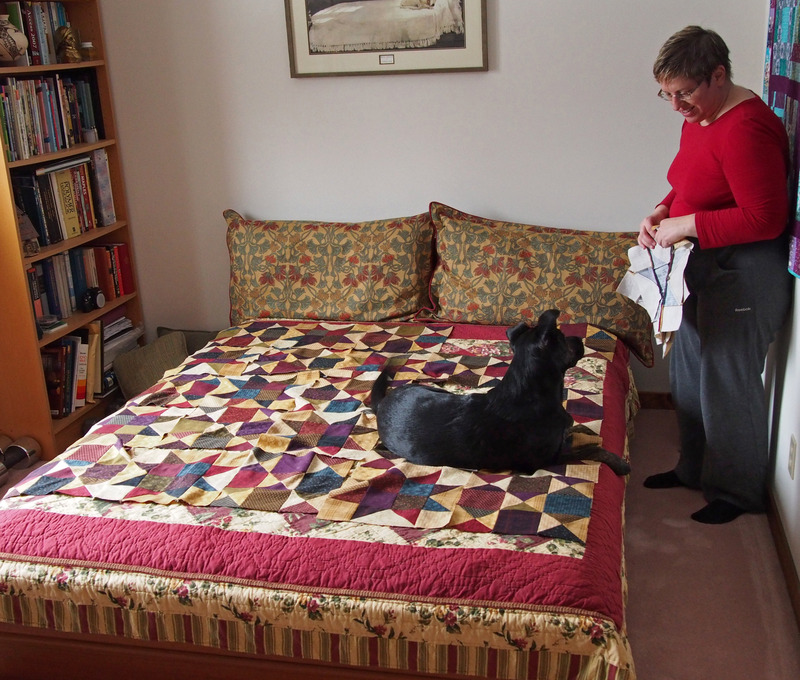 We really had no ideas regarding the quilt motifs to use and left it all up to Karen. She did an amazing job and we couldn’t be happier with it. Last, but not least mom and I added the binding under Millie’s watchful eyes. All totaled there were about 70 ladies that helped to create this quilt. It really was a group project and my mom and I want to thank all of you for your help. We certainly couldn’t have done it without you. 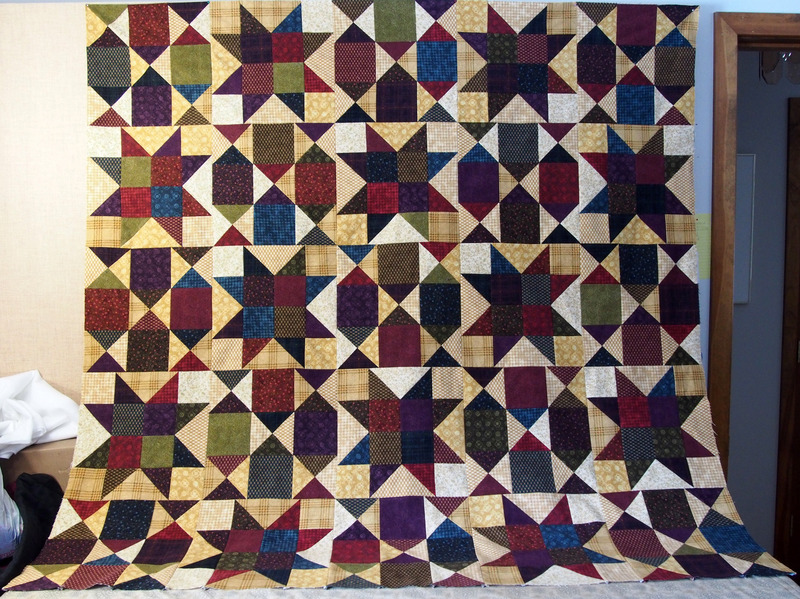 Very soon you will be able to purchase raffle tickets to win this quilt. If any of my readers buy a ticket just remember that if you win you have to give the quilt to me 😉 !